Percutaneous coronary intervention (PCI), also known as coronary angioplasty, is a nonsurgical technique for treating obstructive coronary artery disease, including unstable angina, acute myocardial infarction (MI), and multivessel coronary artery disease (CAD). See the image below. 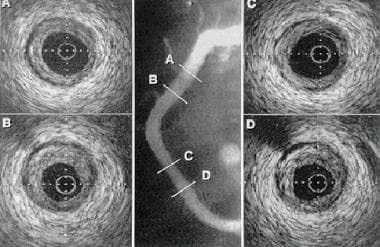 Example of intravascular ultrasonography (IVUS) image in percutaneous transluminal coronary angioplasty (PTCA). In an asymptomatic or mildly symptomatic patient, objective evidence of a moderate to large area of viable myocardium or moderate to severe ischemia on noninvasive testing is an indication for PCI. Angiographic indications include hemodynamically significant lesions in vessels serving viable myocardium (vessel diameter >1.5 mm). Clinical contraindications for PCI include intolerance of long-term antiplatelet therapy or the presence of any significant comorbid conditions that severely limit the lifespan of the patient (this is a relative contraindication). A Heart Team approach (involving interventional cardiologists and cardiac surgeons) should be used in patients with diabetes and multivessel coronary artery disease and in patients with severe left main disease and a high Syntax score. For patients with STEMI, immediate coronary angiography with PCI is recommended (primary PCI). Ischemia-guided approach is recommended for patients with a low-risk score (TIMI 0 or 1, GRACE < 109). See Periprocedural Care and Devices for more detail. Use of proton pump inhibitors (PPIs) is appropriate in patients with multiple risk factors for gastrointestinal bleeding who require antiplatelet therapy. See Technique and Medication for more detail. Since the first human percutaneous transluminal coronary angioplasty (PTCA) procedure was performed in 1977, the use of percutaneous coronary intervention (PCI) has increased dramatically; it is now one of the most commonly performed medical interventions. Originally developed in Switzerland by Andreas Gruentzig, PCI has transformed the practice of revascularization for coronary artery disease (CAD). Coronary angioplasty, initially used in the treatment of patients with stable angina and discrete lesions in a single coronary artery, currently has multiple indications, including unstable angina, acute myocardial infarction (AMI), and multivessel CAD. With the combination of sophisticated equipment, experienced operators, and modern drug therapy, PCI has evolved into an effective nonsurgical modality for treating patients with CAD. Ongoing technical advances are allowing more patients with chronic total occlusions (CTOs) to be successfully treated percutaneously. Improvements in catheter technique and the development of new devices and medications have paralleled our growing understanding of cardiovascular physiology, the pathogenesis of atherosclerosis, and the response to vascular injury. Intracoronary stents and atherectomy devices have been developed to increase the success and decrease the complications of conventional balloon dilation, as well as to expand the indications for revascularization. Interventionalists now can safely treat more complex coronary lesions and restenosis. The development of drug-eluting stents (DESs) has substantially reduced the problem of restenosis seen with bare-metal stents (BMSs). At the same time, advances in intravascular ultrasonography (IVUS), optical coherence tomography (OCT), and fractional flow reserve (FFR) evaluation have improved the understanding of coronary plaque morphology, plaque vulnerability, and coronary physiology. Furthermore, many of these technologies are able to help identify patients who will benefit most from PCI, coronary artery bypass grafting (CABG), or medical therapy. Adjunctive pharmacologic therapies aimed at preventing acute reocclusion have also improved the safety and efficacy of PCI. Angiographic indications include hemodynamically significant lesions in vessels serving viable myocardium (vessel diameter >1.5 mm). Clinical contraindications for PCI include intolerance of chronic antiplatelet therapy and the presence of any significant comorbid conditions that severely limit patient lifespan (this is a relative contraindication). A Heart Team approach (involving interventional cardiologists and cardiac surgeons) should be used in patients with diabetes and multivessel CAD and in patients with severe left main disease and a high Syntax score. In addition, the patient’s ability to tolerate and comply with dual antiplatelet therapy is a consideration in the choice of PCI rather than CABG. In the focused update on appropriate use criteria published in 2012,  the use of coronary revascularization for patients with ACS and combinations of significant symptoms or ischemia was generally viewed favorably. However, the use of revascularization for asymptomatic patients or patients with low-risk findings on noninvasive testing and minimal medical therapy was viewed probably as unnecessary. Rao et al examined the safety of same-day discharge in 107,018 low-risk patients 65 years or older who underwent elective PCI at 903 sites. Only 1.25% of patients were discharged on the same day, and there was significant variation across facilities. Patients who were discharged on the same day had shorter procedures with less multivessel intervention. Notably, there were no significant differences between same-day discharge and overnight-stay patients with regard to mortality or rehospitalization rate either at 2 days or at 30 days. Two meta-analyses that compared same-day discharge after elective PCI with overnight admission, including both radial and femoral approaches, showed no evidence for harm. [6, 7] Same-day discharge seems reasonable in carefully selected patients undergoing largely elective PCI. There have been limited trials of coronary stenting versus medical therapy in patients with stable angina. Most of the data are derived from studies of balloon angioplasty vs medical therapy (eg, the RITA-II [Randomized Intervention in the Treatment of Angina]  and AVERT [Atorvastatin Versus Revascularization Treatment]  trials) or studies involving minimally symptomatic patients (eg, the COURAGE [Clinical Outcomes Utilizing Revascularization and Aggressive Drug Evaluation]  trial). In this study, death or definite myocardial infarction occurred in 6.3% of the balloon angioplasty patients and in 3.3% of the medical patients; only 44% of the deaths were actually due to heart disease. Angina improved in both groups, but a 16.5% absolute excess of grade 2 or worse angina was noted in the medical group 3 months after randomization. In the medical group, 23% of patients required revascularization during follow-up. In the angioplasty group, 7.9% of patients required bypass surgery during follow-up, compared with 5.8% in the medically treated group. It is important to emphasize that although the patients in RITA-II were asymptomatic or mildly symptomatic, most had severe anatomic CAD: 62% had multivessel CAD, and 34% had important disease of the proximal LAD artery. In the AVERT trial, 13% of the medically treated group and 21% of the angioplasty group had ischemic events at 18 months, suggesting that in low-risk patients with stable CAD, aggressive lipid-lowering therapy may reduce ischemic events as effectively as balloon angioplasty does. A total of 341 patients with stable CAD symptoms, normal left ventricular (LV) function, and class I or II angina were assigned randomly to balloon angioplasty or atorvastatin therapy. On the basis of the limited data available from randomized trials comparing medical therapy with balloon angioplasty, it seems appropriate to consider medical therapy for initial management of most patients with Canadian Cardiovascular Society Classification class I and II symptoms and to reserve percutaneous or surgical revascularization for patients with more severe symptoms and ischemia. The COURAGE trial demonstrated that in patients with minimal, stable angina symptoms and coronary artery stenosis, medical therapy alone may be an appropriate strategy if such therapy can control the angina symptoms. The trial randomized the addition of PCI to intensive pharmacologic therapy, with the endpoints of death from any cause and nonfatal MI during a median follow-up period of 4.6 years. It is important to emphasize that all patients in the COURAGE study underwent coronary angiography. Inclusion criteria included the presence of a 70% or greater lesion in 1 or more proximal epicardial arteries, American College of Cardiology (ACC)/American Heart Association (AHA) class I or II indications for PCI, and objective evidence of myocardial ischemia on stress testing. For both primary endpoints, there was no statistically significant difference between patients who received PCI with medical therapy and those who received only medical therapy. Teo et al found that in older patients with stable CAD, optimal medical treatment without PCI remains an appropriate initial management strategy. Analysis of 904 patients aged 65 years or older showed that, during a median 4.6-year follow-up, clinical outcome was no better or worse in patients randomized to optimal medical treatment plus PCI than in patients who received optimal medical treatment alone. Compared with 1381 patients younger than 65 years with CAD, older patients had similar success in achieving treatment targets and similar rates of myocardial infarction, stroke, and major cardiac events, though the death rate was two to three times higher in the older patients. It should be kept in mind that the analysis was done from patients enrolled in the COURAGE trial and thus must be interpreted in terms of the limitations outlined above. Using a combined endpoint (cardiac death, myocardial infarction, or refractory angina necessitating revascularization by surgery), the MASS (Medicine, Angioplasty, or Surgery Study) trial showed that after 3 years of follow-up, endpoint events occurred in 24% of angioplasty patients, 17% of medical patients, and 3% of surgical patients. However, overall survival rates were similar in the three groups. The other trial evaluated balloon angioplasty against bypass surgery with an internal thoracic (mammary) artery graft to the LAD artery and also reported no difference in survival during follow-up. Although 94% of angioplasty patients and 95% of bypass patients were free of limiting symptoms, the former required more antianginal drugs. At 2.5 years’ follow-up, 86% of surgery patients were free from late events, compared with 43% of angioplasty patients. This difference was primarily due to restenosis necessitating a second revascularization procedure. It is important to emphasizing that balloon angioplasty, rather than stent placement, was used in both of these trials; with the almost exclusive use of stenting in the current era, restenosis rates are now lower. Five large (N > 300) randomized trials comparing balloon angioplasty with bypass surgery in patients with multivessel CAD all showed that in appropriately selected patients, the rates of death or of MI were similar, regardless of which treatment was employed. [16, 17, 18, 19, 20] However, more of the angioplasty-treated patients required a second revascularization procedure. Three of these studies are summarized in Table 1 below. BARI = Bypass Angioplasty Revascularization Investigation; CABG = coronary artery bypass grafting; MI = myocardial infarction; PTCA = percutaneous transluminal coronary angioplasty. In the BARI (Bypass Angioplasty Revascularization Investigation) study, 5-year survival was 86.3% for those assigned to angioplasty versus 89.3% for those assigned to surgery, and 5-year freedom from Q-wave MI was 78.7% for the former and 80.4% for the latter. However, after 5 years of follow-up, 54% of those assigned to angioplasty required an additional revascularization procedure, compared with only 8% of those assigned to surgery. Similarly, the ERACI (Argentine Randomized Trial of Percutaneous Transluminal Coronary Angioplasty Versus Coronary Artery Bypass Surgery in Multivessel Disease) study showed that freedom from combined cardiac events at 3 years was significantly better for bypass surgery than for angioplasty (77% vs 47%), though the groups did not differ in terms of overall and cardiac mortality or frequency of MI. Bypass patients were more often free of angina (79% vs 57%) and had fewer additional revascularization procedures (6% vs 37%). The major limitations of balloon angioplasty were acute vessel closure and restenosis. Early studies with intracoronary stents showed that these devices were highly effective for treating or preventing acute or threatened vessel closure and thereby avoiding emergency bypass surgery. Two randomized trials, BENESTENT (Belgian Netherlands Stent)  and STRESS (Stent Restenosis Study),  demonstrated that coronary stenting of de novo lesions in native vessels reduced angiographic restenosis by approximately 30% as compared with conventional balloon angioplasty. Stenting produces a larger lumen diameter than conventional balloon angioplasty both immediately after the procedure (acute gain) and at follow-up (net gain), resulting in less restenosis. The use of BMSs was compared to bypass surgery for the treatment of multivessel CAD in the ARTS (Arterial Revascularization Therapies Study) trial. After 1 year of follow-up, no difference was noted between the groups in the rate of death, stroke, or MI. Event-free survival was better in the surgery group than in the stent group (87.8% vs 73.8%), and only 3.5% in the surgery group required a second revascularization procedure, compared with 16.8% in the stent group. The SoS (Stent or Surgery) trial compared BMSs with CABG and reported a 2-year target vessel revascularization rate of 21% in stent patients, compared with 6% in CABG patients. Death and MI rates were similar in the two groups. However, the SoS trial had a higher noncardiac death rate in the PCI arm, thought to be attributed to a type II error that may have affected the study results. According to the New York Cardiac Registry, as with the prior trials, patients who received PCI as the initial therapy had a higher incidence of target vessel revascularization (35.1%) than those who received CABG (4.9%). The registry identified 59,314 patients with multivessel disease who either underwent CABG (n = 37,212) or had PCI with bare-metal stents (n = 22,102), with reported endpoints of repeat revascularization and survival rates within 3 years. Using unadjusted survival curves, the registry demonstrated that for patients who had two-vessel disease without LAD artery involvement, PCI offered a small survival benefit. For patients who had two-vessel disease with proximal LAD artery involvement, the two procedures had similar mortalities (91.4% for CABG and 91.2% for PCI). The registry reported a statistically significant survival benefit of CABG over PCI in patients who had three-vessel disease with proximal LAD artery involvement. The New York Cardiac Registry found that patients who underwent PCI with a DES had a higher rate of target vessel revascularization than those who underwent CABG (30.6% vs 5.2%). They analyzed 17,400 patients who either received a DES (n = 9963) or underwent CABG (n = 7437) and observed them for 18 months. Unadjusted survival curves did not demonstrate a statistical significance in survival for two- or three-vessel disease. At 5 years, the major adverse cardiac and cerebrovascular events (MACCE)—a composite of death, stroke, MI, or repeat revascularization—was significantly higher in patients with PCI than in those with CABG (37.5% vs 24.2%). PCI, as opposed to CABG, resulted in significantly higher rates of all-cause death (14.6% vs 9.2%), MI (9.2 vs 4.0%), and repeat revascularization (25.4% vs 12.6%); however, the rate of stroke was similar. In this trial, the extent of CAD was assessed by using a SYNTAX score that was based on location, severity, and degree of stenosis. In patients with a low (0-22) SYNTAX score, PCI and CABG resulted in similar rates of MACCE (33.3% vs 26.8%) but PCI was associated with significantly more repeat revascularization (25.4% vs 12.6%). In patients with intermediate (23-32) or high (≥33) SYNTAX scores, CABG demonstrated clear superiority, with lower rates of MACCE, all-cause death, MI, and repeat revascularization. In conclusion, the SYNTAX trial suggested that in patients with multivessel CAD, survival rates with CABG and PCI are comparable in patients with relatively uncomplicated and lesser degrees of CAD. However, in patients with complex and diffuse CAD, CABG appears to be preferable. One caveat to be remembered is that the SYNTAX trial used first-generation paclitaxel-eluting stents. These stents have a higher rate of restenosis than the currently used second-generation DESs. In summary, in deciding between PCI and CABG in patients with complex multivessel CAD, a Heart Team approach is recommended. Patients with diabetes mellitus appear to constitute an exception to the general findings that balloon angioplasty and bypass surgery yield essentially equivalent results in patients with multivessel disease. Among diabetic patients in the BARI trial, 5-year survival was 65.5% in those treated by balloon angioplasty and 80.6% for those treated with bypass surgery. The improved survival with surgery was due to reduced cardiac mortality (5.8% vs 20.6%) and was confined to those receiving at least one internal thoracic artery graft. Better survival among diabetic patients with multivessel disease treated with bypass surgery rather than angioplasty was also observed in a large retrospective study. The BARI 2D (Bypass Angioplasty Revascularization Investigation 2 Diabetes) trial randomized 2364 men and women with type 2 diabetes mellitus, documented CAD, stable symptoms, and myocardial ischemia treated with optimal medical therapy to an initial strategy of either coronary revascularization or watchful waiting with the option of subsequent revascularization. At 5 years, rates of survival or the composite endpoint of cardiovascular death, MI, and stroke did not differ significantly between the groups. In summary, in deciding between PCI and CABG in patients with diabetes mellitus and complex multivessel CAD, a Heart Team approach is recommended. CABG is generally recommended in preference to PCI, provided that the patient is a good candidate for surgery, there is extensive CAD (eg, three-vessel CAD or complex two-vessel CAD involving the proximal LAD artery), and the LAD artery can be anastomosed with a left internal mammary artery (LIMA) graft, CABG is generally recommended in preference to PCI. The management of patients with non-STEMI (NSTEMI) and unstable angina (called NSTE-ACS in the 2014 ACC/AHA guideline update to reflect the similarity between the two groups) has changed considerably over the past 15 years. Several trials have helped provide a better understanding of risk stratification, selection of initial management strategy, and appropriate use of adjunctive medical therapy and revascularization, thereby leading to improved outcomes. In general, two pathways have emerged for the treatment of NSTE-ACS. The early invasive strategy, with a diagnostic coronary angiogram for risk stratification, allows rapid definitive evaluation and affords the option for early revascularization to prevent ACS complications and facilitate early discharge. In contrast, the ischemia-guided strategy (previously termed conservative strategy) recommends invasive evaluation only if patients have failed medical therapy, have objective evidence of ischemia on stress test, or have high prognostic risk (ie, high Thrombolysis in Myocardial Infarction [TIMI] or Global Registry of Acute Coronary Events [GRACE] scores). This is based on the premise that medical therapy alone can stabilize some patients, thus obviating costly and possibly unnecessary invasive procedures. In contrast to the VANQWISH trial, four randomized studies found that an early invasive approach in patients with ACS was associated with improved outcomes. The FRISC (Fragmin and Fast Revascularization during Instability in Coronary Artery Disease) II trial prospectively randomized 2457 patients to receive either early invasive treatment with intracoronary stenting or noninvasive treatment and found that at 6 months, the composite endpoint of death or MI was higher in the latter arm than in the former. Additionally, symptoms of angina and hospital readmissions were twice as common in the noninvasive arm as in the invasive arm. The RITA-III study reported improved outcomes with early invasive therapy in 1810 patients at 5 years’ follow-up. There was a statistically significant difference favoring an interventional strategy over conservative therapy with respect to all-cause mortality (15.1% vs 12.1%) and the rate of cardiac death or MI (15.9% vs 12.2%). At 3 years’ follow-up, the ICTUS trial documented a trend toward significance favoring the selective invasive strategy for the combined endpoints (30% early invasive vs 26% selective invasive) but reported no differences in all-cause mortality and cardiac death. Overall, the weight of evidence has favored early invasive therapy over the ischemia-guided strategy, with one collaborative meta-analysis of randomized trials showing an 18% relative reduction in death or MI. The invasive arm was also associated with less angina and fewer hospitalizations. In a meta-analysis of patient-level data from FRISC, ICTUS, and RITA trials, 14.7% of patients treated according to the early invasive strategy had cardiovascular death or nonfatal MI, versus 17.9% in the selective invasive group. Absolute risk reduction of cardiovascular death and nonfatal MI was 2-3.8 % in the low-to-intermediate group and 11.1% in the highest-risk patient. The recognition that intracoronary thrombosis from a ruptured plaque is the primary cause of vessel occlusion in STEMI and that prompt restoration of vessel patency provides significant clinical benefit has led to the development of two main reperfusion strategies. Thrombolytic therapies, such as front-loaded tissue plasminogen activator (t-PA), reteplase (r-PA), and tenecteplase (TNK), open approximately 60-80% of infarct-related vessels within 90 minutes, but only 50% of these vessels will have normal (TIMI grade 3) flow. In addition, 10% of vessels opened by thrombolysis either become reoccluded or are the source for recurrent symptoms of angina. Also, patients older than 75 years, who have the most to gain from reperfusion, have unacceptably high rates of intracerebral hemorrhage with thrombolysis. Because of these limitations, several randomized trials have evaluated mechanical revascularization with primary angioplasty in the setting of STEMI. The advantage of this approach is that the artery can be opened more frequently (>95%), and the underlying plaque rupture can be treated. In this study, longer door-to-balloon times were associated with a higher adjusted risk of in-hospital mortality, in a continuous nonlinear fashion (30 min = 3%, 60 min = 3.5%, 90 min = 4.3%, 120 min = 5.6%, 150 min = 7%, 180 min = 8.4%). A reduction in door-to-balloon time from 90 minutes to 60 minutes was associated with a 0.8% reduction in mortality, and a reduction from 60 minutes to 30 minutes was associated with a 0.5% reduction in mortality. The use of thrombolytic therapy followed by referral for intentional PCI (facilitated PCI) has not been shown to be superior to primary PCI and may actually worsen outcomes, with increased risk of stroke and bleeding (ASSENT 4). However, urgent transfer to a PCI-capable hospital for coronary angiography and possible “rescue PCI” is reasonable for STEMI patients with failed reperfusion or reocclusion after thrombolytic therapy. Indeed, the term facilitated PCI is now considered obsolete. The recommended strategy for thrombolysis is a full dose of a thrombolytic, aspirin, clopidogrel, and immediate transfer to a PCI-capable facility. PCI of a noninfarct artery at the time of PCI in patients without hemodynamic compromise is classified as a “class III – harm” recommendation and should not be performed. Current STEMI guidelines recommend the use of a GPIIb/IIIa inhibitor (class IIa abciximab, tirofiban or eptifibatide) at the time of primary PCI in selected patients who are receiving unfractionated heparin (those who have a large thrombus burden or inadequate P2Y12 receptor antagonist loading). Routine use of GPIIb/IIIa inhibitors with bivalirudin is not recommended and may be considered as an adjunctive or “bailout” strategy in selected cases. Intracoronary abciximab administration, in comparison with the intravenous (IV) standard route, can improve short-term clinical outcomes in patients with STEMI undergoing primary PCI. Stone et al studied the safety and efficacy of DESs and BMSs in 3006 patients with STEMI who underwent primary PCI. Patients were assigned in a 3:1 ratio to receive paclitaxel-eluting stents or otherwise identical BMSs. The paclitaxel-eluting stents significantly reduced angiographic evidence of restenosis and recurrent ischemia necessitating repeat revascularization at 12-month follow-up. The rates of death and stent thrombosis were similar for the two groups. The STEMI guidelines recommend 1 year of P2Y12 inhibitor therapy for patients who receive a BMS or a DES with clopidogrel, prasugrel, or ticagrelor. From a procedural perspective, because primary PCI involves a thrombotic plaque, there is a potential for thrombotic complications including no-reflow and distal embolization. In these patients, there is some evidence that stenting plus GPIIb/IIIa inhibition will improve outcomes, as well as reduce target vessel revascularization and MI rates. An analysis of 291,380 patients with AMI who underwent PCI of native coronary artery stenoses showed that no-reflow developed in 2.3%. Risk factors included older age, STEMI, prolonged interval from symptom onset to admission, and cardiogenic shock. Angiographic factors associated with no-reflow included longer lesion length, class C lesions, bifurcation lesions, and impaired preprocedural TIMI flow. No-reflow was associated with greater in-hospital mortality. The authors concluded that no-reflow, though uncommon, is associated with adverse clinical outcomes. Of interest has been the recognition that failure of complete reperfusion based on myocardial blush grade or incomplete ST-segment resolution (~50 % of patients with primary PCI) is associated with poorer outcomes despite normal epicardial flow. Efforts to reduce distal embolization using several strategies have been developed. Despite early promise from mechanical aspiration devices, intracoronary GPIIb/IIIa inhibitor use, and stent-based exclusion (Mesh Guard), none of these approaches has been proved to offer definitive benefit. [Guideline] Amsterdam EA, Wenger NK, Brindis RG, et al; ACC, AHA Task Force on Practice Guidelines, SCAI, et al. 2014 AHA/ACC Guideline for the Management of Patients with Non-ST-Elevation Acute Coronary Syndromes: a report of the American College of Cardiology/American Heart Association Task Force on Practice Guidelines. J Am Coll Cardiol. 2014 Dec 23. 64 (24):e139-228. [Medline]. [Guideline] O'Gara PT, Kushner FG, Ascheim DD, et al, American College of Cardiology Foundation/American Heart Association Task Force on Practice Guidelines. 2013 ACCF/AHA guideline for the management of ST-elevation myocardial infarction: a report of the American College of Cardiology Foundation/American Heart Association Task Force on Practice Guidelines. Circulation. 2013 Jan 29. 127 (4):e362-425. [Medline]. [Guideline] Levine GN, Bates ER, Blankenship JC, Bailey SR, Bittl JA, Cercek B, et al. 2011 ACCF/AHA/SCAI Guideline for Percutaneous Coronary Intervention: a report of the American College of Cardiology Foundation/American Heart Association Task Force on Practice Guidelines and the Society for Cardiovascular Angiography and Interventions. Circulation. 2011 Dec 6. 124 (23):e574-651. [Medline]. Coronary Revascularization Writing G, Patel MR, Dehmer GJ, Hirshfeld JW, Smith PK, Spertus JA, et al. ACCF/SCAI/STS/AATS/AHA/ASNC/HFSA/SCCT 2012 appropriate use criteria for coronary revascularization focused update: a report of the American College of Cardiology Foundation Appropriate Use Criteria Task Force, Society for Cardiovascular Angiography and Interventions, Society of Thoracic Surgeons, American Association for Thoracic Surgery, American Heart Association, American Society of Nuclear Cardiology, and the Society of Cardiovascular Computed Tomography. J Thorac Cardiovasc Surg. 2012. 143(4):780-803. [Medline]. Rao SV, Kaltenbach LA, Weintraub WS, Roe MT, Brindis RG, Rumsfeld JS, et al. Prevalence and outcomes of same-day discharge after elective percutaneous coronary intervention among older patients. JAMA. 2011. 306(13):1461-7. [Medline]. Abdelaal E, Rao SV, Gilchrist IC, Bernat I, Shroff A, Caputo R, et al. Same-day discharge compared with overnight hospitalization after uncomplicated percutaneous coronary intervention: a systematic review and meta-analysis. JACC Cardiovasc Intervent. 2013. 6(2):99-112. [Medline]. Brayton KM, Patel VG, Stave C, de Lemos JA, Kumbhani DJ. Same-day discharge after percutaneous coronary intervention: a meta-analysis. J Am Coll Cardiol. 2013. 62(4):275-85. [Medline]. Fox KA, Poole-Wilson P, Clayton TC, Henderson RA, Shaw TR, Wheatley DJ, et al. 5-year outcome of an interventional strategy in non-ST-elevation acute coronary syndrome: the British Heart Foundation RITA 3 randomised trial. Lancet. 2005. 366(9489):914-20. [Medline]. Fox KA, Poole-Wilson PA, Henderson RA, Clayton TC, Chamberlain DA, Shaw TR, et al. Interventional versus conservative treatment for patients with unstable angina or non-ST-elevation myocardial infarction: the British Heart Foundation RITA 3 randomised trial. Randomized Intervention Trial of unstable Angina. Lancet. 2002. 360(9335):743-51. [Medline]. Parisi AF, Folland ED, Hartigan P. A comparison of angioplasty with medical therapy in the treatment of single-vessel coronary artery disease. Veterans Affairs ACME Investigators. N Engl J Med. 1992. 326(1):10-6. [Medline]. Coronary angioplasty versus medical therapy for angina: the second Randomised Intervention Treatment of Angina (RITA-2) trial. RITA-2 trial participants. Lancet. 1997 Aug 16. 350 (9076):461-8. [Medline]. Pitt B, Waters D, Brown WV, van Boven AJ, Schwartz L, Title LM, et al. Aggressive lipid-lowering therapy compared with angioplasty in stable coronary artery disease. Atorvastatin versus Revascularization Treatment Investigators. N Engl J Med. 1999. 341(2):70-6. [Medline]. Teo KK, Sedlis SP, Boden WE, O'Rourke RA, Maron DJ, Hartigan PM, et al. Optimal medical therapy with or without percutaneous coronary intervention in older patients with stable coronary disease: a pre-specified subset analysis of the COURAGE (Clinical Outcomes Utilizing Revascularization and Aggressive druG Evaluation) trial. J Am Coll Cardiol. 2009 Sep 29. 54 (14):1303-8. [Medline]. Hueb W, Soares PR, Gersh BJ, Cesar LA, Luz PL, Puig LB, et al. The medicine, angioplasty, or surgery study (MASS-II): a randomized, controlled clinical trial of three therapeutic strategies for multivessel coronary artery disease: one-year results. J Am Coll Cardiol. 2004. 43(10):1743-51. [Medline]. Hueb WA, Soares PR, Almeida De Oliveira S, Ariê S, Cardoso RH, Wajsbrot DB, et al. Five-year follow-op of the medicine, angioplasty, or surgery study (MASS): A prospective, randomized trial of medical therapy, balloon angioplasty, or bypass surgery for single proximal left anterior descending coronary artery stenosis. Circulation. 1999 Nov 9. 100 (19 Suppl):II107-13. [Medline]. Stone GW, Lansky AJ, Pocock SJ, Gersh BJ, Dangas G, Wong SC, et al. Paclitaxel-eluting stents versus bare-metal stents in acute myocardial infarction. N Engl J Med. 2009. 360(19):1946-59. [Medline]. Henderson RA, Pocock SJ, Sharp SJ, Nanchahal K, Sculpher MJ, Buxton MJ, et al. Long-term results of RITA-1 trial: clinical and cost comparisons of coronary angioplasty and coronary-artery bypass grafting. Randomised Intervention Treatment of Angina. Lancet. 1998. 352(9138):1419-25. [Medline]. Henderson RA, Pocock SJ, Clayton TC, Knight R, Fox KA, Julian DG, et al. Seven-year outcome in the RITA-2 trial: coronary angioplasty versus medical therapy. J Am Coll Cardiol. 2003. 42(7):1161-70. [Medline]. Alderman EL, Kip KE, Whitlow PL, Bashore T, Fortin D, Bourassa MG, et al. Native coronary disease progression exceeds failed revascularization as cause of angina after five years in the Bypass Angioplasty Revascularization Investigation (BARI). J Am Coll Cardiol. 2004. 44(4):766-74. [Medline]. Pocock SJ, Henderson RA, Rickards AF, Hampton JR, King SB 3rd, Hamm CW, et al. Meta-analysis of randomised trials comparing coronary angioplasty with bypass surgery. Lancet. 1995 Nov 4. 346 (8984):1184-9. [Medline]. Rodriguez A, Boullon F, Perez-Balino N, Paviotti C, Liprandi MI, Palacios IF. Argentine randomized trial of percutaneous transluminal coronary angioplasty versus coronary artery bypass surgery in multivessel disease (ERACI): in-hospital results and 1-year follow-up. ERACI Group. J Am Coll Cardiol. 1993. 22(4):1060-7. [Medline]. Stone GW, McLaurin BT, Cox DA, Bertrand ME, Lincoff AM, Moses JW, et al. Bivalirudin for patients with acute coronary syndromes. N Engl J Med. 2006. 355(21):2203-16. [Medline]. Hlatky MA, Boothroyd DB, Bravata DM, Boersma E, Booth J, Brooks MM, et al. Coronary artery bypass surgery compared with percutaneous coronary interventions for multivessel disease: a collaborative analysis of individual patient data from ten randomised trials. Lancet. 2009. 373(9670):1190-7. [Medline]. Serruys PW, de Jaegere P, Kiemeneij F, Macaya C, Rutsch W, Heyndrickx G, et al. A comparison of balloon-expandable-stent implantation with balloon angioplasty in patients with coronary artery disease. Benestent Study Group. N Engl J Med. 1994. 331(8):489-95. [Medline]. Fischman DL, Leon MB, Baim DS, Schatz RA, Savage MP, Penn I, et al. A randomized comparison of coronary-stent placement and balloon angioplasty in the treatment of coronary artery disease. Stent Restenosis Study Investigators. N Engl J Med. 1994. 331(8):496-501. [Medline]. Serruys PW, Ong AT, van Herwerden LA, Sousa JE, Jatene A, Bonnier JJ, et al. Five-year outcomes after coronary stenting versus bypass surgery for the treatment of multivessel disease: the final analysis of the Arterial Revascularization Therapies Study (ARTS) randomized trial. J Am Coll Cardiol. 2005. 46(4):575-81. [Medline]. Rodriguez AE, Baldi J, Fernandez Pereira C, Navia J, Rodriguez Alemparte M, Delacasa A, et al. Five-year follow-up of the Argentine randomized trial of coronary angioplasty with stenting versus coronary bypass surgery in patients with multiple vessel disease (ERACI II). J Am Coll Cardiol. 2005. 46(4):582-8. [Medline]. Hannan EL, Racz MJ, Walford G, Jones RH, Ryan TJ, Bennett E, et al. Long-term outcomes of coronary-artery bypass grafting versus stent implantation. N Engl J Med. 2005. 352(21):2174-83. [Medline]. Serruys PW, Lemos PA, van Hout BA, Arterial Revascularisation Therapies Study part II Steering Committee and Investigators. Sirolimus eluting stent implantation for patients with multivessel disease: rationale for the Arterial Revascularisation Therapies Study part II (ARTS II). Heart. 2004 Sep. 90 (9):995-8. [Medline]. Head SJ, Davierwala PM, Serruys PW, Redwood SR, Colombo A, Mack MJ, et al. Coronary artery bypass grafting vs. percutaneous coronary intervention for patients with three-vessel disease: final five-year follow-up of the SYNTAX trial. Eur Heart J. 2014. 35(40):2821-30. [Medline]. Group BDS, Frye RL, August P, Brooks MM, Hardison RM, Kelsey SF, et al. A randomized trial of therapies for type 2 diabetes and coronary artery disease. N Engl J Med. 2009. 360(24):2503-15. [Medline]. Dagenais GR, Lu J, Faxon DP, Kent K, Lago RM, Lezama C, et al. Effects of optimal medical treatment with or without coronary revascularization on angina and subsequent revascularizations in patients with type 2 diabetes mellitus and stable ischemic heart disease. Circulation. 2011. 123(14):1492-500. [Medline]. Farkouh ME, Domanski M, Sleeper LA, Siami FS, Dangas G, Mack M, et al. Strategies for multivessel revascularization in patients with diabetes. N Engl J Med. 2012. 367(25):2375-84. [Medline]. Verma S, Farkouh ME, Yanagawa B, Fitchett DH, Ahsan MR, Ruel M, et al. Comparison of coronary artery bypass surgery and percutaneous coronary intervention in patients with diabetes: a meta-analysis of randomised controlled trials. Lancet Diabetes Endocrinol. 2013. 1(4):317-28. [Medline]. Boden WE, O’Rourke RA, Crawford MH, Blaustein AS, Deedwania PC, Zoble RG, et al. Outcomes in patients with acute non-Q-wave myocardial infarction randomly assigned to an invasive as compared with a conservative management strategy. Veterans Affairs Non-Q-Wave Infarction Strategies in Hospital (VANQWISH) Trial Investigators. N Engl J Med. 1998. 338(25):1785-92. [Medline]. Anderson HV, Cannon CP, Stone PH, Williams DO, McCabe CH, Knatterud GL, et al. One-year results of the Thrombolysis in Myocardial Infarction (TIMI) IIIB clinical trial. A randomized comparison of tissue-type plasminogen activator versus placebo and early invasive versus early conservative strategies in unstable angina and non-Q wave myocardial infarction. J Am Coll Cardiol. 1995. 26(7):1643-50. [Medline]. Invasive compared with non-invasive treatment in unstable coronary-artery disease: FRISC II prospective randomised multicentre study. FRagmin and Fast Revascularisation during InStability in Coronary artery disease Investigators. Lancet. 1999 Aug 28. 354 (9180):708-15. [Medline]. Poole-Wilson PA, Pocock SJ, Fox KA, Henderson RA, Wheatley DJ, Chamberlain DA, et al. Interventional versus conservative treatment in acute non-ST elevation coronary syndrome: time course of patient management and disease events over one year in the RITA 3 trial. Heart. 2006. 92(10):1473-9. [Medline]. Luciardi H, Muntaner J, Berman S, de la Serna F, Costantini C. [Acute coronary syndromes without ST segment elevation. Why should we take an interventionist approach?]. Arch Cardiol Mex. 2001. 71(4):295-305. [Medline]. Hirsch A, Windhausen F, Tijssen JG, Oude Ophuis AJ, van der Giessen WJ, van der Zee PM, et al. Diverging associations of an intended early invasive strategy compared with actual revascularization, and outcome in patients with non-ST-segment elevation acute coronary syndrome: the problem of treatment selection bias. Eur Heart J. 2009. 30(6):645-54. [Medline]. Mehta SR, Cannon CP, Fox KA, Wallentin L, Boden WE, Spacek R, et al. Routine vs selective invasive strategies in patients with acute coronary syndromes: a collaborative meta-analysis of randomized trials. JAMA. 2005. 293(23):2908-17. [Medline]. Fox KA, Clayton TC, Damman P, Pocock SJ, de Winter RJ, Tijssen JG, et al. Long-term outcome of a routine versus selective invasive strategy in patients with non-ST-segment elevation acute coronary syndrome a meta-analysis of individual patient data. J Am Coll Cardiol. 2010. 55(22):2435-45. [Medline]. Mehta SR, Granger CB, Boden WE, Steg PG, Bassand JP, Faxon DP, et al. Early versus delayed invasive intervention in acute coronary syndromes. N Engl J Med. 2009. 360(21):2165-75. [Medline]. Katritsis DG, Siontis GC, Kastrati A, van’t Hof AW, Neumann FJ, Siontis KC, et al. Optimal timing of coronary angiography and potential intervention in non-ST-elevation acute coronary syndromes. Eur Heart J. 2011. 32(1):32-40. [Medline]. Navarese EP, Gurbel PA, Andreotti F, Tantry U, Jeong YH, Kozinski M, et al. Optimal timing of coronary invasive strategy in non-ST-segment elevation acute coronary syndromes: a systematic review and meta-analysis. Ann Intern Med. 2013. 158(4):261-70. [Medline]. Keeley EC, Boura JA, Grines CL. Primary angioplasty versus intravenous thrombolytic therapy for acute myocardial infarction: a quantitative review of 23 randomised trials. Lancet. 2003. 361(9351):13-20. [Medline]. Rathore SS, Curtis JP, Chen J, Wang Y, Nallamothu BK, Epstein AJ, et al. Association of door-to-balloon time and mortality in patients admitted to hospital with ST elevation myocardial infarction: national cohort study. BMJ. 2009. 338:b1807. [Medline]. Brodie BR, Gersh BJ, Stuckey T, Witzenbichler B, Guagliumi G, Peruga JZ, et al. When is door-to-balloon time critical? Analysis from the HORIZONS-AMI (Harmonizing Outcomes with Revascularization and Stents in Acute Myocardial Infarction) and CADILLAC (Controlled Abciximab and Device Investigation to Lower Late Angioplasty Complications) trials. J Am Coll Cardiol. 2010. 56(5):407-13. [Medline]. Hochman JS, Lamas GA, Buller CE, Dzavik V, Reynolds HR, Abramsky SJ, et al. Coronary intervention for persistent occlusion after myocardial infarction. N Engl J Med. 2006. 355(23):2395-407. [Medline]. Wald DS, Morris JK, Wald NJ, Chase AJ, Edwards RJ, Hughes LO, et al. Randomized trial of preventive angioplasty in myocardial infarction. N Engl J Med. 2013. 369(12):1115-23. [Medline]. Piccolo R, Gu YL, Iversen AZ, Dominguez-Rodriguez A, de Smet BJ, Mahmoud KD, et al. Clinical impact of intracoronary abciximab in patients undergoing primary percutaneous coronary intervention: an individual patient data pooled analysis of randomised studies. Heart. 2012. [Medline]. Stone GW, Maehara A, Witzenbichler B, Godlewski J, Parise H, Dambrink JH, et al. Intracoronary abciximab and aspiration thrombectomy in patients with large anterior myocardial infarction: the INFUSE-AMI randomized trial. JAMA. 2012. 307(17):1817-26. [Medline]. Harrison RW, Aggarwal A, Ou FS, Klein LW, Rumsfeld JS, Roe MT, et al. Incidence and outcomes of no-reflow phenomenon during percutaneous coronary intervention among patients with acute myocardial infarction. Am J Cardiol. 2013. 111(2):178-84. [Medline]. Reifart N, Vandormael M, Krajcar M, Gohring S, Preusler W, Schwarz F, et al. Randomized comparison of angioplasty of complex coronary lesions at a single center. Excimer Laser, Rotational Atherectomy, and Balloon Angioplasty Comparison (ERBAC) Study. Circulation. 1997. 96(1):91-8. [Medline]. Baim DS, Wahr D, George B, Leon MB, Greenberg J, Cutlip DE, et al. Randomized trial of a distal embolic protection device during percutaneous intervention of saphenous vein aorto-coronary bypass grafts. Circulation. 2002. 105(11):1285-90. [Medline]. Zimarino M, Corcos T, Favereau X, Commeau P, Tamburino C, Spaulding C, et al. Rotational coronary atherectomy with adjunctive balloon angioplasty for the treatment of ostial lesions. Cathet Cardiovasc Diagn. 1994. 33(1):22-7. [Medline]. Généreux P, Bettinger N, Redfors B, Lee AC, Kim CY, Lee MS, et al. Two-year outcomes after treatment of severely calcified coronary lesions with the orbital atherectomy system and the impact of stent types: Insight from the ORBIT II trial. Catheter Cardiovasc Interv. 2016 Sep. 88 (3):369-77. [Medline]. Stone GW, Kedhi E, Kereiakes DJ, Parise H, Fahy M, Serruys PW, et al. Differential clinical responses to everolimus-eluting and Paclitaxel-eluting coronary stents in patients with and without diabetes mellitus. Circulation. 2011 Aug 23. 124 (8):893-900. [Medline]. Baber U, Mehran R, Sharma SK, Brar S, Yu J, Suh JW, et al. Impact of the everolimus-eluting stent on stent thrombosis: a meta-analysis of 13 randomized trials. J Am Coll Cardiol. 2011. 58(15):1569-77. [Medline]. Bangalore S, Amoroso N, Fusaro M, Kumar S, Feit F. Outcomes with various drug-eluting or bare metal stents in patients with ST-segment-elevation myocardial infarction: a mixed treatment comparison analysis of trial level data from 34 068 patient-years of follow-up from randomized trials. Circ Cardiovasc Interv. 2013 Aug. 6 (4):378-90. [Medline]. Piscione F, Piccolo R, Cassese S, Galasso G, D’Andrea C, De Rosa R, et al. Is direct stenting superior to stenting with predilation in patients treated with percutaneous coronary intervention? Results from a meta-analysis of 24 randomised controlled trials. Heart. 2010. 96(8):588-94. [Medline]. Kereiakes DJ, Meredith IT, Windecker S, Lee Jobe R, Mehta SR, Sarembock IJ, et al. Efficacy and safety of a novel bioabsorbable polymer-coated, everolimus-eluting coronary stent: the EVOLVE II Randomized Trial. Circ Cardiovasc Interv. 2015 Apr. 8 (4):[Medline]. [Full Text]. Ellis SG, Kereiakes DJ, Metzger DC, Caputo RP, Rizik DG, Teirstein PS, et al. Everolimus-Eluting Bioresorbable Scaffolds for Coronary Artery Disease. N Engl J Med. 2015 Nov 12. 373 (20):1905-15. [Medline]. [Full Text]. Vlaar PJ, Svilaas T, van der Horst IC, Diercks GF, Fokkema ML, de Smet BJ, et al. Cardiac death and reinfarction after 1 year in the Thrombus Aspiration during Percutaneous coronary intervention in Acute myocardial infarction Study (TAPAS): a 1-year follow-up study. Lancet. 2008. 371(9628):1915-20. [Medline]. De Vita M, Burzotta F, Porto I, Dudek D, Lefevre T, Trani C, et al. Thrombus aspiration in ST elevation myocardial infarction: comparative efficacy in patients treated early and late after onset of symptoms. Heart. 2010. 96(16):1287-90. [Medline]. Frobert O, Lagerqvist B, Olivecrona GK, Omerovic E, Gudnason T, Maeng M, et al. Thrombus aspiration during ST-segment elevation myocardial infarction. N Engl J Med. 2013. 369(17):1587-97. [Medline]. Lagerqvist B, Frobert O, Olivecrona GK, Gudnason T, Maeng M, Alstrom P, et al. Outcomes 1 year after thrombus aspiration for myocardial infarction. N Engl J Med. 2014. 371(12):1111-20. [Medline]. Jolly SS, Cairns JA, Yusuf S, et al, TOTAL Investigators. Randomized trial of primary PCI with or without routine manual thrombectomy. N Engl J Med. 2015 Apr 9. 372 (15):1389-98. [Medline]. [Full Text]. Elgendy IY, Huo T, Bhatt DL, Bavry AA. Is Aspiration Thrombectomy Beneficial in Patients Undergoing Primary Percutaneous Coronary Intervention? Meta-Analysis of Randomized Trials. Circ Cardiovasc Interv. 2015 Jul. 8 (7):e002258. [Medline]. [Full Text]. [Guideline] Levine GN, Bates ER, Blankenship JC, et al. 2015 ACC/AHA/SCAI Focused Update on Primary Percutaneous Coronary Intervention for Patients With ST-Elevation Myocardial Infarction: An Update of the 2011 ACCF/AHA/SCAI Guideline for Percutaneous Coronary Intervention and the 2013 ACCF/AHA Guideline for the Management of ST-Elevation Myocardial Infarction. J Am Coll Cardiol. 2016 Mar 15. 67 (10):1235-50. [Medline]. Brennan JM, Al-Hejily W, Dai D, Shaw RE, Trilesskaya M, Rao SV, et al. Three-year outcomes associated with embolic protection in saphenous vein graft intervention: results in 49 325 senior patients in the Medicare-linked National Cardiovascular Data Registry CathPCI Registry. Circ Cardiovasc Interv. 2015 Mar. 8 (3):e001403. [Medline]. [Full Text]. Kaltoft A, Kelbaek H, Klovgaard L, Terkelsen CJ, Clemmensen P, Helqvist S, et al. Increased rate of stent thrombosis and target lesion revascularization after filter protection in primary percutaneous coronary intervention for ST-segment elevation myocardial infarction: 15-month follow-up of the DEDICATION (Drug Elution and Distal Protection in ST Elevation Myocardial Infarction) trial. J Am Coll Cardiol. 2010. 55(9):867-71. [Medline]. Biancari F, D’Andrea V, Di Marco C, Savino G, Tiozzo V, Catania A. Meta-analysis of randomized trials on the efficacy of vascular closure devices after diagnostic angiography and angioplasty. Am Heart J. 2010. 159(4):518-31. [Medline]. Nikolsky E, Mehran R, Halkin A, Aymong ED, Mintz GS, Lasic Z, et al. Vascular complications associated with arteriotomy closure devices in patients undergoing percutaneous coronary procedures: a meta-analysis. J Am Coll Cardiol. 2004. 44(6):1200-9. [Medline]. Vaitkus PT. A meta-analysis of percutaneous vascular closure devices after diagnostic catheterization and percutaneous coronary intervention. J Invasive Cardiol. 2004. 16(5):243-6. [Medline]. Koreny M, Riedmuller E, Nikfardjam M, Siostrzonek P, Mullner M. Arterial puncture closing devices compared with standard manual compression after cardiac catheterization: systematic review and meta-analysis. JAMA. 2004. 291(3):350-7. [Medline]. Brar SS, Aharonian V, Mansukhani P, Moore N, Shen AY, Jorgensen M, et al. Haemodynamic-guided fluid administration for the prevention of contrast-induced acute kidney injury: the POSEIDON randomised controlled trial. Lancet. 2014. 383(9931):1814-23. [Medline]. Investigators ACT. Acetylcysteine for prevention of renal outcomes in patients undergoing coronary and peripheral vascular angiography: main results from the randomized Acetylcysteine for Contrast-induced nephropathy Trial (ACT). Circulation. 2011. 124(11):1250-9. [Medline]. Romagnoli E, Biondi-Zoccai G, Sciahbasi A, Politi L, Rigattieri S, Pendenza G, et al. Radial versus femoral randomized investigation in ST-segment elevation acute coronary syndrome: the RIFLE-STEACS (Radial Versus Femoral Randomized Investigation in ST-Elevation Acute Coronary Syndrome) study. J Am Coll Cardiol. 2012 Dec 18. 60 (24):2481-9. [Medline]. Jolly SS, Yusuf S, Cairns J, Niemela K, Xavier D, Widimsky P, et al. Radial versus femoral access for coronary angiography and intervention in patients with acute coronary syndromes (RIVAL): a randomised, parallel group, multicentre trial. Lancet. 2011. 377(9775):1409-20. [Medline]. Valgimigli M, Gagnor A, Calabró P, et al, MATRIX Investigators. Radial versus femoral access in patients with acute coronary syndromes undergoing invasive management: a randomised multicentre trial. Lancet. 2015 Jun 20. 385 (9986):2465-76. [Medline]. Rao SV, Tremmel JA, Gilchrist IC, Shah PB, Gulati R, Shroff AR, et al. Best practices for transradial angiography and intervention: a consensus statement from the society for cardiovascular angiography and intervention’s transradial working group. Cathet Cardiovasc Interv. 2014. 83(2):228-36. [Medline]. Cavusoglu E, Kini AS, Marmur JD, Sharma SK. Current status of rotational atherectomy. Cathet Cardiovasc Interv. 2004. 62(4):485-98. [Medline]. Pijls NH, Fearon WF, Tonino PA, Siebert U, Ikeno F, Bornschein B, et al. Fractional flow reserve versus angiography for guiding percutaneous coronary intervention in patients with multivessel coronary artery disease: 2-year follow-up of the FAME (Fractional Flow Reserve Versus Angiography for Multivessel Evaluation) study. J Am Coll Cardiol. 2010. 56(3):177-84. [Medline]. De Bruyne B, Fearon WF, Pijls NH, Barbato E, Tonino P, Piroth Z, et al. Fractional flow reserve-guided PCI for stable coronary artery disease. N Engl J Med. 2014. 371(13):1208-17. [Medline]. Johnson NP, Tóth GG, Lai D, et al. Prognostic value of fractional flow reserve: linking physiologic severity to clinical outcomes. J Am Coll Cardiol. 2014 Oct 21. 64 (16):1641-54. [Medline]. [Full Text]. Serruys PW, Herrman JP, Simon R, Rutsch W, Bode C, Laarman GJ, et al. A comparison of hirudin with heparin in the prevention of restenosis after coronary angioplasty. Helvetica Investigators. N Engl J Med. 1995. 333(12):757-63. [Medline]. Burchenal JE, Marks DS, Tift Mann J, Schweiger MJ, Rothman MT, Ganz P, et al. Effect of direct thrombin inhibition with Bivalirudin (Hirulog) on restenosis after coronary angioplasty. Am J Cardiol. 1998. 82(4):511-5. [Medline]. Bittl JA, Strony J, Brinker JA, Ahmed WH, Meckel CR, Chaitman BR, et al. Treatment with bivalirudin (Hirulog) as compared with heparin during coronary angioplasty for unstable or postinfarction angina. Hirulog Angioplasty Study Investigators. N Engl J Med. 1995. 333(12):764-9. [Medline]. Mehran R, Lansky AJ, Witzenbichler B, Guagliumi G, Peruga JZ, Brodie BR, et al. Bivalirudin in patients undergoing primary angioplasty for acute myocardial infarction (HORIZONS-AMI): 1-year results of a randomised controlled trial. Lancet. 2009. 374(9696):1149-59. [Medline]. Lopes RD, Alexander KP, Manoukian SV, Bertrand ME, Feit F, White HD, et al. Advanced age, antithrombotic strategy, and bleeding in non-ST-segment elevation acute coronary syndromes: results from the ACUITY (Acute Catheterization and Urgent Intervention Triage Strategy) trial. J Am Coll Cardiol. 2009. 53(12):1021-30. [Medline]. Tavano D, Visconti G, D’Andrea D, Focaccio A, Golia B, Librera M, et al. Comparison of bivalirudin monotherapy versus unfractionated heparin plus tirofiban in patients with diabetes mellitus undergoing elective percutaneous coronary intervention. Am J Cardiol. 2009. 104(9):1222-8. [Medline]. Steg PG, van ‘t Hof A, Hamm CW, Clemmensen P, Lapostolle F, Coste P, et al. Bivalirudin started during emergency transport for primary PCI. N Engl J Med. 2013. 369(23):2207-17. [Medline]. Shahzad A, Kemp I, Mars C, Wilson K, Roome C, Cooper R, et al. Unfractionated heparin versus bivalirudin in primary percutaneous coronary intervention (HEAT-PPCI): an open-label, single centre, randomised controlled trial. Lancet. 2014 Nov 22. 384(9957):1849-58. [Medline]. Valgimigli M, Frigoli E, Leonardi S, et al, MATRIX Investigators. Bivalirudin or Unfractionated Heparin in Acute Coronary Syndromes. N Engl J Med. 2015 Sep 10. 373 (11):997-1009. [Medline]. [Full Text]. [Guideline] Levine GN, Bates ER, Bittl JA, Brindis RG, Fihn SD, Fleisher LA, et al. 2016 ACC/AHA Guideline Focused Update on Duration of Dual Antiplatelet Therapy in Patients With Coronary Artery Disease: A Report of the American College of Cardiology/American Heart Association Task Force on Clinical Practice Guidelines: An Update of the 2011 ACCF/AHA/SCAI Guideline for Percutaneous Coronary Intervention, 2011 ACCF/AHA Guideline for Coronary Artery Bypass Graft Surgery, 2012 ACC/AHA/ACP/AATS/PCNA/SCAI/STS Guideline for the Diagnosis and Management of Patients With Stable Isc... Circulation. 2016 Sep 6. 134 (10):e123-55. [Medline]. [Full Text]. Montalescot G, Bolognese L, Dudek D, et al, ACCOAST Investigators. Pretreatment with prasugrel in non-ST-segment elevation acute coronary syndromes. N Engl J Med. 2013 Sep 12. 369 (11):999-1010. [Medline]. [Full Text]. [Guideline] Roffi M, Patrono C, Collet JP, et al; Management of Acute Coronary Syndromes in Patients Presenting without Persistent ST-Segment Elevation of the European Society of Cardiology. 2015 ESC Guidelines for the management of acute coronary syndromes in patients presenting without persistent ST-segment elevation: Task Force for the Management of Acute Coronary Syndromes in Patients Presenting without Persistent ST-Segment Elevation of the European Society of Cardiology (ESC). Eur Heart J. 2016 Jan 14. 37 (3):267-315. [Medline]. [Full Text]. Dangas G, Mehran R, Guagliumi G, Caixeta A, Witzenbichler B, Aoki J, et al. Role of clopidogrel loading dose in patients with ST-segment elevation myocardial infarction undergoing primary angioplasty: results from the HORIZONS-AMI (harmonizing outcomes with revascularization and stents in acute myocardial infarction) trial. J Am Coll Cardiol. 2009. 54(15):1438-46. [Medline]. Price MJ, Berger PB, Teirstein PS, Tanguay JF, Angiolillo DJ, Spriggs D, et al. Standard- vs high-dose clopidogrel based on platelet function testing after percutaneous coronary intervention: the GRAVITAS randomized trial. JAMA. 2011. 305(11):1097-105. [Medline]. Ellis KJ, Stouffer GA, McLeod HL, Lee CR. Clopidogrel pharmacogenomics and risk of inadequate platelet inhibition: US FDA recommendations. Pharmacogenomics. 2009 Nov. 10 (11):1799-817. [Medline]. Mega JL, Simon T, Collet JP, Anderson JL, Antman EM, Bliden K, et al. Reduced-function CYP2C19 genotype and risk of adverse clinical outcomes among patients treated with clopidogrel predominantly for PCI: a meta-analysis. JAMA. 2010. 304(16):1821-30. [Medline]. Siller-Matula JM, Trenk D, Schror K, Gawaz M, Kristensen SD, Storey RF, et al. Response variability to P2Y12 receptor inhibitors: expectations and reality. JACC Cardiovasc Intervent. 2013. 6(11):1111-28. [Medline]. Angiolillo DJ, Ferreiro JL, Price MJ, Kirtane AJ, Stone GW. Platelet function and genetic testing. J Am Coll Cardiol. 2013. 62(17 Suppl):S21-31. [Medline]. Bhatt DL, Cryer BL, Contant CF, et al. COGENT Investigators. Clopidogrel with or without omeprazole in coronary artery disease. N Engl J Med. 2010 Nov 11. 363(20):1909-17. [Medline]. Morrow DA, Wiviott SD, White HD, Nicolau JC, Bramucci E, Murphy SA, et al. Effect of the novel thienopyridine prasugrel compared with clopidogrel on spontaneous and procedural myocardial infarction in the Trial to Assess Improvement in Therapeutic Outcomes by Optimizing Platelet Inhibition with Prasugrel-Thrombolysis in Myocardial Infarction 38: an application of the classification system from the universal definition of myocardial infarction. Circulation. 2009. 119(21):2758-64. [Medline]. Wallentin L, Becker RC, Budaj A, et al. PLATO Investigators, Freij A, Thorsén M. Ticagrelor versus clopidogrel in patients with acute coronary syndromes. N Engl J Med. 2009 Sep 10. 361(11):1045-57. [Medline]. Lincoff AM, Tcheng JE, Califf RM, Kereiakes DJ, Kelly TA, Timmis GC, et al. Sustained suppression of ischemic complications of coronary intervention by platelet GP IIb/IIIa blockade with abciximab: one-year outcome in the EPILOG trial. Evaluation in PTCA to Improve Long-term Outcome with abciximab GP IIb/IIIa blockade. Circulation. 1999. 99(15):1951-8. [Medline]. Zeymer U, Margenet A, Haude M, Bode C, Lablanche JM, Heuer H, et al. Randomized comparison of eptifibatide versus abciximab in primary percutaneous coronary intervention in patients with acute ST-segment elevation myocardial infarction: results of the EVA-AMI Trial. J Am Coll Cardiol. 2010. 56(6):463-9. [Medline]. Winchester DE, Wen X, Brearley WD, Park KE, Anderson RD, Bavry AA. Efficacy and safety of glycoprotein IIb/IIIa inhibitors during elective coronary revascularization: a meta-analysis of randomized trials performed in the era of stents and thienopyridines. J Am Coll Cardiol. 2011. 57(10):1190-9. [Medline]. Daugherty SL, Thompson LE, Kim S, Rao SV, Subherwal S, Tsai TT, et al. Patterns of use and comparative effectiveness of bleeding avoidance strategies in men and women following percutaneous coronary interventions: an observational study from the National Cardiovascular Data Registry. J Am Coll Cardiol. 2013. 61(20):2070-8. [Medline]. Feldman DN, Swaminathan RV, Kaltenbach LA, Baklanov DV, Kim LK, Wong SC, et al. Adoption of radial access and comparison of outcomes to femoral access in percutaneous coronary intervention: an updated report from the national cardiovascular data registry (2007-2012). Circulation. 2013. 127(23):2295-306. [Medline]. Bønaa KH, Mannsverk J, Wiseth R, et al, NORSTENT Investigators. Drug-Eluting or Bare-Metal Stents for Coronary Artery Disease. N Engl J Med. 2016 Sep 29. 375 (13):1242-52. [Medline]. [Full Text]. Stone GW, Ellis SG, Colombo A, Dawkins KD, Grube E, Cutlip DE, et al. Offsetting impact of thrombosis and restenosis on the occurrence of death and myocardial infarction after paclitaxel-eluting and bare metal stent implantation. Circulation. 2007. 115(22):2842-7. [Medline]. Mayer K, Bernlochner I, Braun S, Schulz S, Orban M, Morath T, et al. Aspirin treatment and outcomes after percutaneous coronary intervention: results of the ISAR-ASPI registry. J Am Coll Cardiol. 2014. 64(9):863-71. [Medline]. Percutaneous transluminal coronary angioplasty (PTCA). Rotational atherectomy catheter (Rotablator) is designed for removal of plaque from coronary arteries. This device has diamond-studded burr at its tip, rotates at about 160,000 rpm, and is particularly well suited for ablation of calcific or fibrotic plaque material. Percutaneous transluminal coronary angioplasty (PTCA). TRISTAR stent. Percutaneous transluminal coronary angioplasty (PTCA). NIR stent. Percutaneous transluminal coronary angioplasty (PTCA). Wallstent. Mechanism of restenosis following percutaneous transluminal coronary angioplasty (PTCA). Fractional flow ratio (FFR). Pressure wire is advanced across left anterior descending (LAD) artery stenosis, and intracoronary adenosine is given. FFR ratio is recorded at baseline and then after adenosine push is given. Here, LAD lesion and FFR post adenosine are shown.